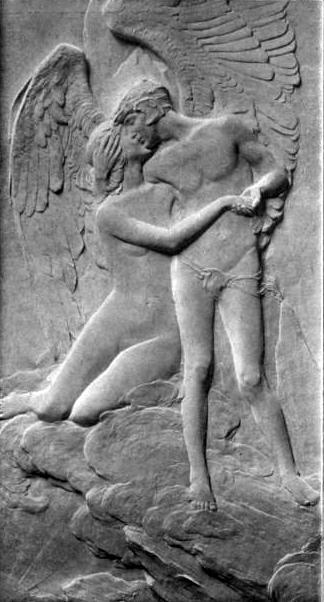 Cupid and Psyche, by Mortimer Brown . One of those sculptors who was born late in the 19th Century and worked in the traditions of the New Sculptors, and then survived through past World War II. 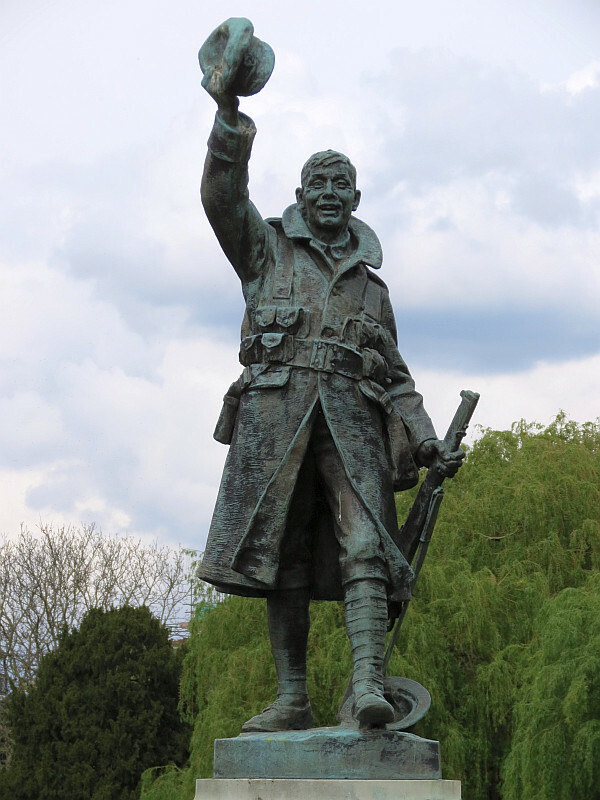 His principle public monument is in fact a war memorial, in Twickenham, put up as a WWI memorial in the 1920s. He is recorded as studying in the 1890s under Edouard Lanteri at the Royal College of Art and then at the Royal Academy Schools, and later periods for Hamo Thornycroft, exhibited at the Royal Academy from 1900-1916, but never made it to Royal Academician. Mortimer Brown came to prominent notice with his statue of St John the Baptist , exhibited at the Academy in 1901, and thereafter produced a range of figure subjects and groups, portraits, and a few animal sculptures. His high point came in about 1912, with his Shepherd Boy , a study in youthfulness, which was bought by the Chantrey Bequest. The Twickenham War Memorial dates from about 1925, and his work seems to have petered out after this. His early, more interesting oeuvre includes Biblical and Classical subjects – as well as the St John already mentioned, we may note especially the group of Aeneas leaving Troy , dating from 1900, thus very early in his career, a lively and contorted Samson slaying the Philistine , in a Renaissance pose, a Blind Beggar in Jerusalem , and a fine panel in low relief entitled Journeying to the Holy Sepulchre , showing the body of Christ being born in a procession of mourners, delicately modelled but sparing of extraneous detail. From what I have seen of his work, including in reproduction only, Mortimer Brown tended to favour male figure subjects, youthful or if ideal, of a youthful athletic rather than hugely muscular physique. His works do include some females, including a statue of a young girl with an infant called Untouched with Any Shade of Years , a carefully composed grouping of a mother with her dead infant in relief, called Bereaved , and a charming Burne-Jonesish low relief of Cupid and Psyche , very sweet, shown at the top of this page. His Twickenham memorial figure, also shown here, is in a more modern idiom. His animal work which springs to mind include a standing figure of a lion called A Monarch of the East , and some lesser big cat snarling at a snake, entitled The Combat – both seemingly anatomically careful works. The Twickenham War Memorial .